No matter how healthy we try to be, over time our bodies take in toxins from foods we eat, water we drink, and air we breathe; these toxins can build up in our cells and cause illnesses and other ailments. With a wrap, heat penetrates the skin resulting in muscle relaxation and skin revitalization. The ultimate goal: toxins and excess fluid are eliminated from the body. 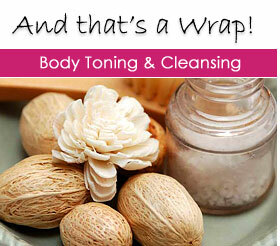 Body wraps help exfoliate, hydrate and tone the skin. The basic wrap procedure involves covering the body with sea clay, mineral or herbal solutions, and then wrapping the body with light sheets. There is one essential point to remember: It is very important to drink lots of water before, during and after a body wrap.